Review of Sierra Nevada Torpedo Extra IPA | Beer Apprentice - Craft Beer News, Reviews, Interviews and Info. 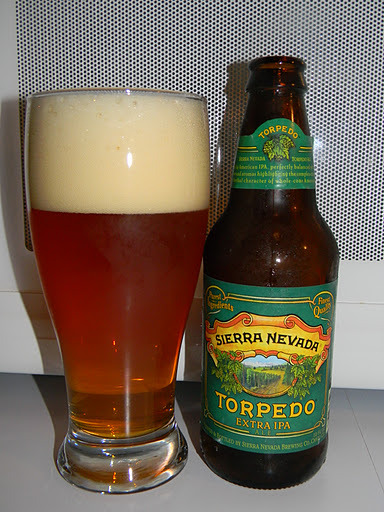 For today’s craft beer review I’m going to be sipping on the Sierra Nevada Torpedo Extra IPA brewed by the Sierra Nevada Brewing Company located in Chico, California. I’ve had this brew many times, but have yet to “properly” review it. That’s all about to change because I have a fresh bottle and I’m ready to get started. The website, sierranevada.com, has this description of the Torpedo. Around here, we take hops pretty seriously, which is why we weren’t satisfied with the standard method of dry hopping for our first year-round IPA. We spent years tinkering, tasting, and tweaking ways to get the biggest and best hop flavors and aromas into our beer. Our persistence has paid off. Our obsession with harnessing huge hop flavor led to the development of what we call the hop torpedo, a revolutionary method of dry-hopping designed, built, and debuted here at the brewery. Our torpedo is a sleek, stainless-steel piece of hardware that delivers more pure hop aroma than any method of dry-hopping we’ve ever seen. Like all our beers, Torpedo Extra IPA uses only the best whole-cone hops possible making this delicious ale worth the wait. This brew comes in a 12 oz. bottle and it has an ABV of 7.2%. The Torpedo poured a clear orange to golden honey color. A very big, frothy, soft, soapy, off white head was formed from a medium aggressive pour that held great retention and left behind some clingy lacing. It looked great in the glass. The aroma started with big bursts of grapefruit citrus. It was very floral, bright and piny. It was quite resiny with an additional grassy hop profile. Some biscuity malts showed through as it began to warm a bit and a caramel sweetness and light hint of tangerine made their presence known also. I must say the smell was very fresh and enticing. The taste presented loads of grapefruit citrus and piny hops. A strong bitterness and “bite” really woke the palate. It was just a wee bit tart with a slight peppery spice. Not much, just a little tickle. The biscuity malt and caramel sweetness seemed very mild and tame, which allowed the hops to really stand out and shine. Again, very fresh and nice. The mouthfeel was a sturdy medium. It was dry, sticky, “bitey”, crisp, snappy and refreshing. Only the most faint amount of warmth was felt, however a tremendous amount of flavor completely coated the palate with each gulp. Man. This is still a great beer. It’s a staple in any craft beer drinkers diet in my opinion. A beer that must be revisited from time to time so as not to take it for granted. It has a great appearance, wonderful aroma and it’s full of flavor. It’s very easy to drink and not so complicated that it couldn’t be enjoyed by someone wanting to experience a proper IPA. That’s really all that needs to be said about the Sierra Nevada Torpedo. If for some reason you have yet to try this beer, I would recommend that you pick up a bottle the next time you visit your bottle shop. I always pick up a few bottles throughout the year myself.